After years of use, we would need to refinish worn surface of our hardwood flooring. This would allow us to recapture the original value and beauty of our hardwood flooring. We could start by removing carpets, drapes and furniture. When sanding worn surface, it is a good idea to choose drum sander. For the sides and corners, we could use an edging machine. These machines can be rented or we may ask professionals to do this for us. Other tools that we need are floor polishers and buffer. When using sanding equaipments, we should have three passes. Replace with finer sandpaper for each pass. After the sanding process is completed, we should vacuum the surface carefully to pick up grit and dust. After all dist and dust are removed from the surface, we should be able to apply proper stain. 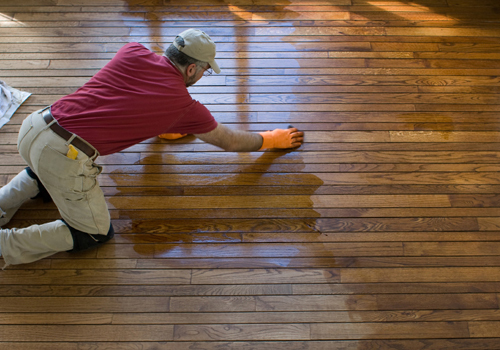 We should choose the proper staining products depending on the type of the wood. Specific products are appropriate for cherry, maple or oak. After the finish has been applied, we should add protective barrier, especially with water-based urethane or polyurethane. The product should be able to protect our hardwood flooring from within. We should read the instruction of any product we use. Any safety advice should be followed. For best results, stains, sealers and coating should be applied based on suggestions. This simple method should help us to regain the original beauty of hardwood flooring. Once our hardwood flooring has restored to its original condition, we should try to maintain it. In high traffic areas, the surface should be protected with mats or rugs. These rugs should be replaced regularly and it is important that the bottom side of the rug is smooth enough and won’t cause abrasion on the surface of hardwood flooring. We should take off stiletto heels when walking on top of hardwood flooring. Nails on our pets should be kept trimmed. Spills should be cleaned immediately with dry cloth or paper tower. Sticky spills can be wiped with damp cloth and it should be rinsed again with another damp, clean paper towel. When moving furniture, we should lift it up, instead of dragging it on top of the surface. Sunlight could also cause discoloration, so we should use blinds and sheers on windows or large doors. With proper maintenance and care, we should be able to allow the surface to retain its beauty longer. Eventually our hardwood flooring would look worn, but restoring them to their former glory should be quite easy to do with limited investment in money, effort and time. When choosing cleaning and re-finishing products, we should check for reviews in the Internet. It is important to compare prices and whether these products are available in our area. Another good way is to maintain contact with hardwood flooring supplier and ask them for professional advices.